Sir Edmund Hillary, the great New Zealand explorer and first conqueror of Everest, died in 2008 to be greeted with unusual displays of affectionate remembrance throughout the countries of the Commonwealth. Politicians honoured his memory. Newspapers published special supplements to recall his life and achievements. It seemed a momentary flashback to the era of Britain's Victorian greatness when a quarter of the Earth's surface was painted red on the map, signifying that it fell under British rule. Among the many plaudits and obituaries that greeted his demise, however, one fascinating aspect of Hillary's life was entirely left out : his search for the Abominable Snowman. Sir Edmund continued his mountain climbing expeditions long after his successful ascent of Everest in 1953. During some of these, he found a number of strange things which intrigued him greatly. For example, on one expedition, he came across some curious hair high up on the snowy mountainside. On others, he found huge footprints. His climbing adventures had brought him into contact with the Sherpa people of Nepal. In fact, it was a Sherpa, Tenzing Norgay, who first climbed Everest with him. The Sherpa people had many legends about strange creatures which seemed to be half ape and half man. Their term for these creatures was translated as "Abominable Snowman", sometimes also called a "Yeti", and Tenzing Norgay even claimed to have seen one himself personally. All of this fascinated Hillary greatly. Although cautious, surveying the wild landscapes of the Nepalese highlands, it seemed to him there were many species unknown to science and, after all, why should some remnant strain of hominid, left behind by evolution, not have survived here in this rugged and desolate land? After securing sponsorship from an American encyclopaedia company, he decided to mount an expedition in search of the Abominable Snowman in 1960. As with most things he did in his life, Hillary prepared carefully, consulting beforehand with the cryptozoologists and experts who claimed to have some knowledge of the Yeti. Photos exist of him holding up artists' drawings of the creature based on witness statements that had been collected. Hillary's expedition studied the curiously large footprints which were sometimes found high in the mountains. They concluded that the footprints were normal ones, left by humans or animals, which had then melted in the sun, a process which elongated the indentations in the snow and made the footprints seem much larger than they had been originally. A scalp, said to be from a Yeti, which had been preserved in a monastery for hundreds of years, was also examined. Scientists concluded that it came from a goat-antelope. 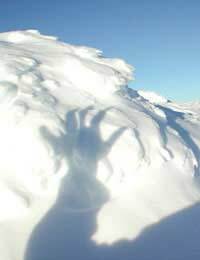 There had been many sightings of Yetis by the Sherpa people but their culture was one that encouraged a ready belief in the supernatural, so it was not clear how much their testimony could be trusted. Alas, Sir Edmund did not find the Abominable Snowman then. Although he did not conclusively dismiss the possibility that Yetis might really exist, he did end up believing that they were probably mythical. His affection for the Sherpa people of Nepal remained intact, however, and he went on to build schools, hospitals and roads in the region to help them. Some people believe that, in addition to its publicly stated goals, Hillary's expedition may also have had a secret military purpose. The Chinese were then engaged in firing missiles from Tibet and some say Hillary, who served as a pilot in World War II, had been commissioned to spy on their activities. It's certainly true that, at one stage, Hillary's radio communications were being jammed by the Chinese military! Sir Edmund Hillary was a remarkable man whose appetite for adventure extended even to the world of ideas. While others dismissed the idea of the Abominable Snowman as preposterous, or contented themselves with writing books about it, Edmund Hillary decided to go out and look for it himself. Though he failed to find it, the results of his expedition were intriguing, and the legend of the Abominable Snowman, or Yeti, has continued to live on to this day.